Many people purchase the small inexpensive hydraulic presses from Harbor Freight, Northern Tool, et al. These small presses usually come with a set of cast iron bed plates that are rough, uneven in thickness, and not flat. For tasks on rifle assemblies they do not always work well due to the size and shape of the cut-outs, so people sometimes resort to finding steel bars at a metals scrapyard or purchasing material online – often with an exorbitant shipping cost. The price shown is for a “standard” set made from AISI 1018 cold-drawn steel that is not heat-treated. 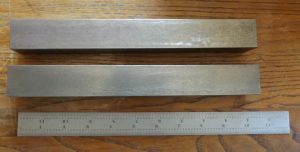 These measure 1-1/4″ x 1-1/4″ x 10″ +/- long. The only work I do to them is to clean, deburr, and make a quick and light draw-file operation to each side. I purchase materials twice weekly and can easily add a customer request to my order. This “standard” pair is sized to be a good fit for 12-ton and 20-ton presses. I do offer these cut and sized to the customer’s request, so if you want a different material, width, thickness, or length just let me know and I will have a price within a business day or so.